Shop Catalinbread Topanga Spring Reverb Effect Pedal from AMS with 0% Interest Payment Plans and Free Shipping. Big wet and splashy. 60’s outboard spring reverb tank. Being an old school effect, tank reverb units were invented before effects loops etc. 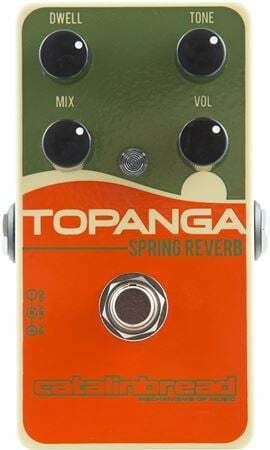 Had the Topanga been invented before the spring tank units, players would have put the pedal in front of their amplifiers and as close to the front of their pedal boards. You should look at your Topanga as a sort of ‘pre-reverb’ type pedal, putting only fuzz boxes in front of it allowing splash, crash, and drench everything downstream. If you have any experience with original tank units, you won’t have any problems finding your way around the Topanga. If you do not have much experience and/or if you simply want to enrich your experience with your Topanga, please check out the manual! The outboard Fender 6G15 spring reverb unit is the sound of Surf guitar, Spaghetti Western and many other great guitar sounds from the sixties. Part of its magic, and how it differs from the internal spring reverb found in most Fender-style amps, is that it is run in front of the amp, causing the reverb signal to distort and sound more intense. Because there were additional knobs on the outboard units, you also have more control over the reverb qualities. The Dwell knob controlled how hard the springs were getting hit by the guitar signal. The Tone knob allowed the treble to be dialed back to just the right degree of brightness. It was also essentially a tube preamp, so it would color the sound going into the amp. All this added up to a very distinctive reverb sound with a lot of attitude and complex non-linearities that are hard to replicate. However, Catalinbread did just that! Besides giving you the classic three knob control compliment of the original, they’ve also added a great discrete preamp that you can control via the Volume knob for a healthy amount of great clean boost when you want it. One pluck of the strings through this box tells you all you need to know. This is vintage verb at it's best. If you're looking to emulate that vintage vibe, this is like time travel in a box.